See pictures and read facts about some of our most popular snakes and other animals. Go to Exhibit Animals. Facts and diagrams about snakes in general. Learn about snakebites, venom, rattles, fangs and more! Go to Information about Snakes. You won't believe our collection of snake memorabilia! Check out a small sample of cool snake stuff. Go to Exhibit Items. 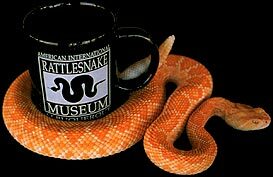 Remember your visit with a Rattlesnake Museum logo T-shirt...Albuquerque's most popular T-shirt! And a great gift idea. Go to the Gift Shop. Why not schedule your next school or group outing for the Rattlesnake Museum? This is a memorable and educational experience that will be enjoyed by all! Go to Group Tours. Don't take our word for it! See what others are saying about the Rattlesnake Museum. Go to Articles & Reviews. True or False? Rattlesnakes are deaf and can't hear the sound of their rattle? Answer this & other questions in our Rattlesnake Trivia. Go to Contests & Other Fun Stuff! Closed one week in January, February and March. Please call for details.